Download "Christmas Theme: The Greatest Gift"
1 Christmas Theme: The Greatest Gift OVERVIEW Key Point: Jesus is the greatest gift of all. Bible Story: The wise men brought gifts Bible Reference: Matthew 2:1-2 Challenge Verse: And we have seen and testify that the Father has sent his Son to be the Savior of the world. 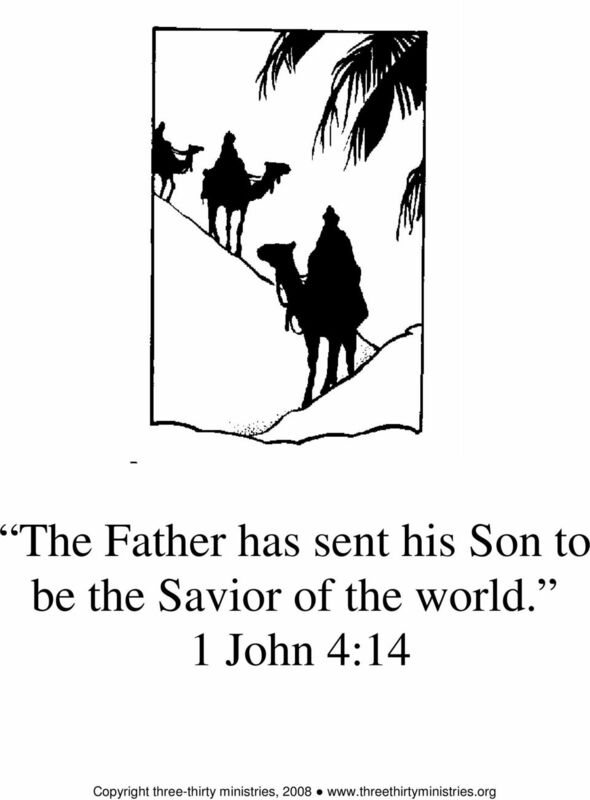 1 John 4:14 Younger option: The Father has sent his Son to be the Savior of the world. 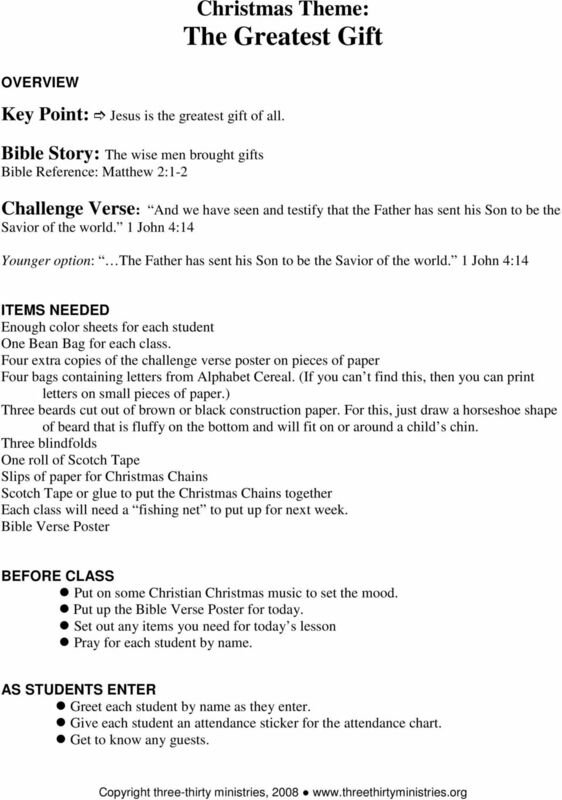 1 John 4:14 ITEMS NEEDED Enough color sheets for each student One Bean Bag for each class. Four extra copies of the challenge verse poster on pieces of paper Four bags containing letters from Alphabet Cereal. (If you can t find this, then you can print letters on small pieces of paper.) Three beards cut out of brown or black construction paper. For this, just draw a horseshoe shape of beard that is fluffy on the bottom and will fit on or around a child s chin. Three blindfolds One roll of Scotch Tape Slips of paper for Christmas Chains Scotch Tape or glue to put the Christmas Chains together Each class will need a fishing net to put up for next week. Bible Verse Poster BEFORE CLASS Put on some Christian Christmas music to set the mood. Put up the Bible Verse Poster for today. Set out any items you need for today s lesson Pray for each student by name. AS STUDENTS ENTER Greet each student by name as they enter. Give each student an attendance sticker for the attendance chart. Get to know any guests. 2 OPENING ACTIVITY Control Tool Anytime you say, What s the greatest gift of all? students should shout back, Jesus! Feel free to have a boys vs. girls or a side vs. side competition to see who can say it the loudest. And remember that students are going to mimic how you say it--so be excited. Leader: What s the greatest gift of all? / Students: Jesus! 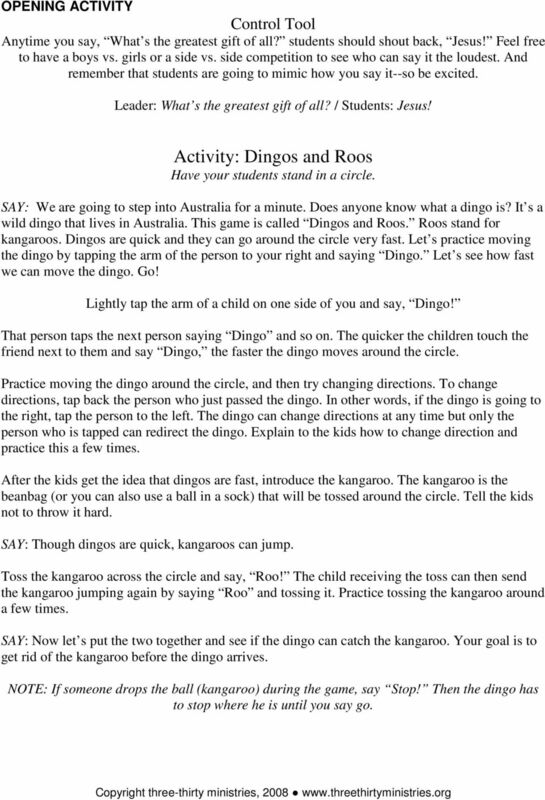 Activity: Dingos and Roos Have your students stand in a circle. SAY: We are going to step into Australia for a minute. Does anyone know what a dingo is? It s a wild dingo that lives in Australia. This game is called Dingos and Roos. Roos stand for kangaroos. Dingos are quick and they can go around the circle very fast. Let s practice moving the dingo by tapping the arm of the person to your right and saying Dingo. Let s see how fast we can move the dingo. Go! Lightly tap the arm of a child on one side of you and say, Dingo! That person taps the next person saying Dingo and so on. The quicker the children touch the friend next to them and say Dingo, the faster the dingo moves around the circle. Practice moving the dingo around the circle, and then try changing directions. To change directions, tap back the person who just passed the dingo. In other words, if the dingo is going to the right, tap the person to the left. The dingo can change directions at any time but only the person who is tapped can redirect the dingo. Explain to the kids how to change direction and practice this a few times. After the kids get the idea that dingos are fast, introduce the kangaroo. The kangaroo is the beanbag (or you can also use a ball in a sock) that will be tossed around the circle. Tell the kids not to throw it hard. SAY: Though dingos are quick, kangaroos can jump. Toss the kangaroo across the circle and say, Roo! The child receiving the toss can then send the kangaroo jumping again by saying Roo and tossing it. Practice tossing the kangaroo around a few times. SAY: Now let s put the two together and see if the dingo can catch the kangaroo. Your goal is to get rid of the kangaroo before the dingo arrives. NOTE: If someone drops the ball (kangaroo) during the game, say Stop! Then the dingo has to stop where he is until you say go. 3 Discussion Ask the students We ve been playing a game about passing something. Who remembers a message that was passed along by an angel? (The angel that appeared to Mary, to Joseph, and the angels that appeared to the shepherds.) Ask the students Who remembers what messages were given. To Mary? (That she would give birth to God s Son) To Joseph? (That the child Mary would have would be God s Son and to name Him Jesus, because He would save His people from their sins.) To the Shepherds? 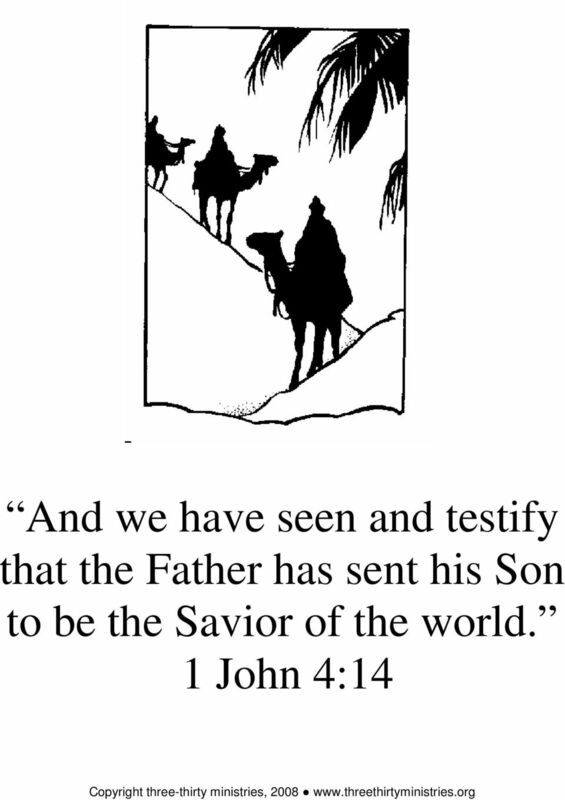 (That the Savior had been born and where they could find Him.) Ask the students Who remembers what the shepherds did after they saw Jesus? (They passed it along to others and you can tell others too.) SAY: The best gift you can give others is to tell them about Jesus. Today we re going to talk about gifts, so raise your hand if you are wearing something you got for Christmas. On the count of three, point to it. Now, we re going to go around the circle and I want you to tell me one thing that you got for Christmas anything you got for Christmas and it doesn t have to be something you re wearing. Ask the students Was is hard just talking about one thing? (It usually is because you are so excited about what you got.) SAY: When we get a great gift, it s hard not to talk about it. That s why when you re excited about Jesus you want to talk about Him. Of all the gifts in the world, He s the greatest gift of all. SAY: After everything I say, say No way! Is the best gift in the world super-sized candy bars? No way! Is the best gift in the world a million dollars? No way! Is the best gift in the world a glass of egg nog? No way! Is the best gift in the world a drink of water when you re in a desert and haven t had anything to drink for 3 days? No way! Is the best gift in the world a brand new and very expensive car? No way! Is the best gift in the world a picture of me? No way! (although who wouldn t want one of those!?) SAY: Now after everything I say, say Jesus! Who was born in a manger? Jesus. Who is God s Son? Jesus. Who is the Savior of the world? Jesus. Who died and rose again? Jesus. Who made a way to take your sins away? Jesus. Who made a way for you to go to heaven? Jesus. Who should be number one in your life? Jesus. What s greatest gift of all? Jesus. 4 CHALLENGE ACTIVITY Control Tool Leader: What s the greatest gift of all? / Students: Jesus! SAY: Get your Bibles ready for a Bible Drill. Ready 1 John 4:14 Go! Read the verse and remind them of the difference between 1 John and the Gospel of John. Ask the students What does testify mean? (To tell or to be a witness to another. In court people testify for or against someone. They are witnesses.) SAY: You can be a witness for Jesus and testify to others that He is the greatest gift of all. CHALLENGE VERSE ACTIVITY Divide your class into four teams and give each team part of a table at which they will work. Then explain to them that you are going to dump out part of the contents of a box of Alphabet Cereal for each team. Their job is to spell as much of the verse as they can in three minutes. If they need to, they can trade letters with another team if that team is willing. Then pour out the letters, but tell them not to start until you say go. (NOTE: You will need some extra copies of the challenge verse one for each team. Younger children will especially need something to look at. They may not be able to read yet but they can match letters.) When the time is finished (and feel free to give them more time if they need it), have them put all the letters in the trash and then come to the circle. Ask the students Did anybody finish the whole verse? SAY: There was something missing and someone who doesn t know Jesus will always have something missing in their life. Everybody was created to have a relationship with God through Jesus. So, when you don t know Christ, there will always be something lacking in your life. The best choice anyone can ever make is to come to Jesus. BIBLE LESSON SAY: Our Bible lesson today is about some men who traveled a long way to come to Jesus. SAY: Get your Bibles ready for a Bible Drill. 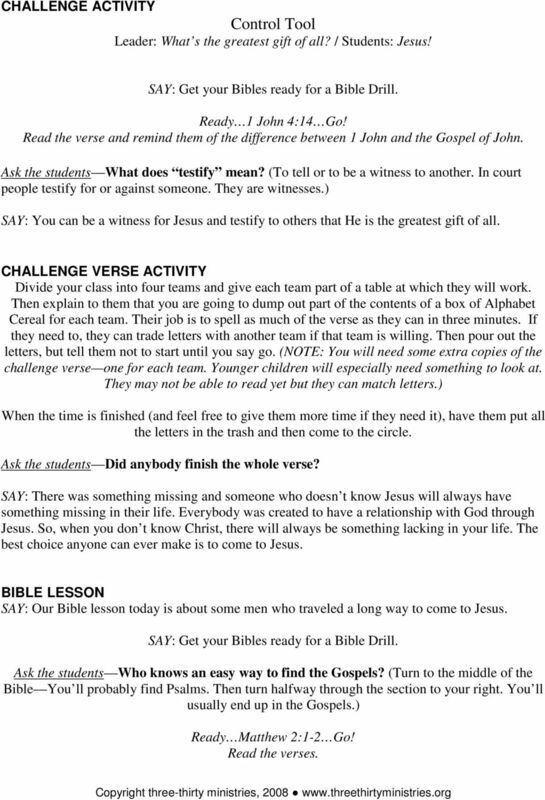 Ask the students Who knows an easy way to find the Gospels? (Turn to the middle of the Bible You ll probably find Psalms. Then turn halfway through the section to your right. You ll usually end up in the Gospels.) Ready Matthew 2:1-2 Go! Read the verses. 5 SAY: Wise men came following a star from the east to find and worship the newborn King and they brought him gifts. Ask the students Who knows what they brought Him? (If they still have their Bibles open, they can look it up it s in verse 11. They brought Him gold, incense (or frankincense) and myrrh. Ask the students How many wise men were there? (We don t really know. The Bible doesn t say. There could have been three they brought three gifts, or there could have been thirtythree.) SAY: The wise men traveled a long way to find Jesus, and wise men today still follow Jesus and help others to know Him as well. Control Tool Leader: What s the greatest gift of all? / Students: Jesus! 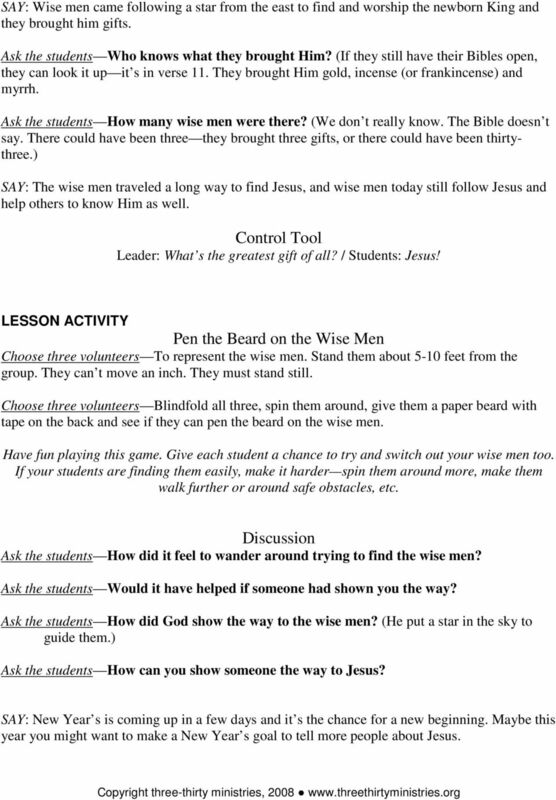 LESSON ACTIVITY Pen the Beard on the Wise Men Choose three volunteers To represent the wise men. Stand them about 5-10 feet from the group. They can t move an inch. They must stand still. Choose three volunteers Blindfold all three, spin them around, give them a paper beard with tape on the back and see if they can pen the beard on the wise men. Have fun playing this game. Give each student a chance to try and switch out your wise men too. If your students are finding them easily, make it harder spin them around more, make them walk further or around safe obstacles, etc. Discussion Ask the students How did it feel to wander around trying to find the wise men? Ask the students Would it have helped if someone had shown you the way? Ask the students How did God show the way to the wise men? (He put a star in the sky to guide them.) 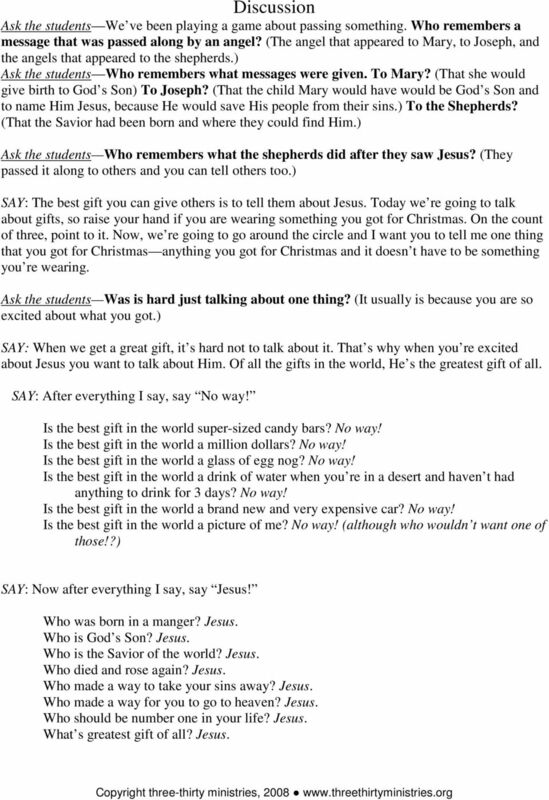 Ask the students How can you show someone the way to Jesus? SAY: New Year s is coming up in a few days and it s the chance for a new beginning. Maybe this year you might want to make a New Year s goal to tell more people about Jesus. 6 LESSON ACTIVITY New Year s Chains Give each student several slips of paper. Tell them to write on them some New Year s goals. Perhaps they want to do better in obeying their mom and dad. Maybe they ve had a bad attitude lately or want to come to Sunday School more. Also, have them write on one of them something they would like God to do in their life during the next year Maybe they d like to lead someone to Christ, or maybe they would like to see a family problem fixed, etc. Add these slips to your class chain. (NOTE: For younger students, you can have them draw a picture of these and then explain them to the class.) 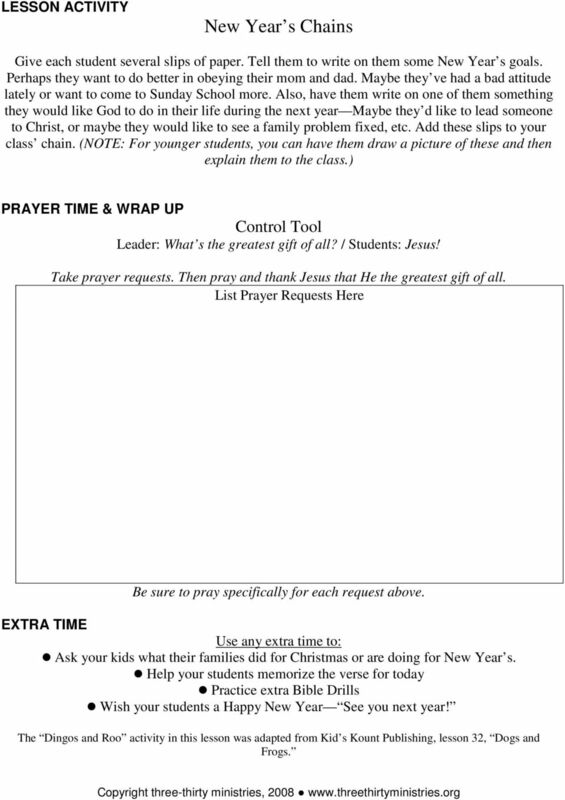 PRAYER TIME & WRAP UP Control Tool Leader: What s the greatest gift of all? / Students: Jesus! Take prayer requests. Then pray and thank Jesus that He the greatest gift of all. List Prayer Requests Here Be sure to pray specifically for each request above. EXTRA TIME Use any extra time to: Ask your kids what their families did for Christmas or are doing for New Year s. Help your students memorize the verse for today Practice extra Bible Drills Wish your students a Happy New Year See you next year! The Dingos and Roo activity in this lesson was adapted from Kid s Kount Publishing, lesson 32, Dogs and Frogs. Also, if the star began to show when Jesus was born, it would have taken a long time to get to Bethlehem from Persia possibly a couple of years. Wise Men. Lesson At-A-Glance. Gather (10 minutes) Arrival Activity Kids help each other follow a path of stars. The Dig. Volume 1 Luke 1 12 Patrick Schwenk. ROAD MAP Bible Story: Paul advises Timothy 2 Timothy 3:16-17 Bottom Line: Learning what God says will help you keep doing what you should. WELCOME HOST: Good morning, guys. I feel so good and healthy.